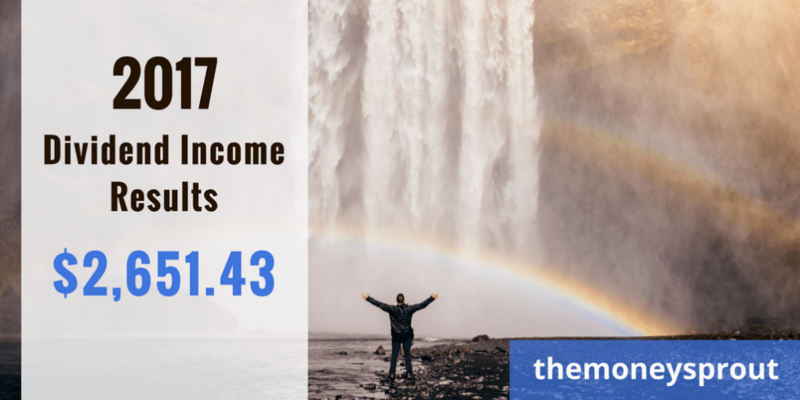 We had a fantastic year in 2017 for our dividend income portfolio. Despite not hitting our new investment goal for the year, we managed to knock our dividend income earnings out of the park! Our goal was to invest at least $16,800 of new money into dividend stocks. We managed just over $12,000. On a positive note, we beat our dividend income goals by over $200, which is an awesome feeling. Our goal was to earn at least $2,400 in dividend income from our taxable brokerage accounts. The good news is that by beating our dividend income goals for 2017, we can now adjust our goals for 2018 higher. I am looking forward to writing about our goals for this year in a future post. Here are a few highlights from the past 12 months of investing in dividend stocks. Please note, we are only discussing dividend stocks found in our taxable brokerage accounts. Starting in 2018, we plan to start including our tax deferred account updates. Once again, it was no surprise that we recorded our highest annual dividend income earnings during 2017. We continue to grow our dividend income each year by double digit returns and are expecting another great year in 2018. Based on our investment philosophy, we should never see a decrease in annual dividend income. Even if we never invest another penny, our dividend income should grow each year. In total, we earned $2,651.43 in dividends paid out from 33 different stocks in our taxable portfolio last year. This was an increase of $733.27 since last year, compared to an increase of $443.16 the prior year end. That is an awesome 38.2% increase since last year (2016). During 2017, we invested $12,119.10 in a variety of dividend stocks. This was actually an increase of $1,431.20 compared to new investments made during 2016. Of course, we would always like to do more … but averaging an extra $1,000+ worth of investments per month isn’t too bad. Using our current yield on cost of 4.48% (see below), I am estimating this new capital increased our 12 month future dividend income by at least $540. Looking forward to 2018, we plan to focus a little more on our tax deferred accounts … but still plan to invest $10,000 to $12,000 in our taxable portfolio. We set several new monthly records in 2017 for dividend income. The largest month ever for us in terms of dividend income was recorded in December 2017. We earned an incredible $448.58 in dividends. It was only 5 short years ago in 2012 when we didn’t earn that much in an entire year! We are looking forward to pushing the $500 dividend income month in 2018. By the end of this year, I think we can get really close if we continue adding new money and give those dollars time to start working for us. Just last year during our 2016 dividend income recap … we were talking about possibly hitting a $300 month in 2017! Well, we blew way past that in December. Who knows … maybe in a few years we will be talking about hitting $1,000 a month in dividend income! Our yield on cost increased slightly from 4.45% in 2016 to 4.48% last year. This was a result of letting our older investments compound and compound. Plus we added a few higher yielding stocks like Omega Healthcare (OHI), Realty Income Corp. (O), and Altria (MO) which helped to bump up the YOC. In addition to adding high yielding companies, we also added to our positions in higher growth companies like Apple (AAPL), CVS Health Corp (CVS), and even Hormel Foods (HRL). Finally, we added shares of stock in the same old boring companies like Aflac (AFL), Target (TGT), and Archer Daniels Midland (ADM) to name a few. The combination of all these new investments, along with shares we have owned for years put our average yield at 4.48%. I like to track a 3-month rolling average when it comes to reporting dividend income. While it is important to keep track of monthly income earned each month, the rolling average accounts for fluctuations month to month. The fluctuations are a result of quarterly payout cycles dividend stocks payout on. We ended 2017, with a 3-month rolling average = $240.67, way up from $168.38 at the start of the year. If everything goes to plan, we hope to push this average close to $300 by the end of 2018. We finished the year with a portfolio of 33 dividend stocks that represent 9 different sectors. Back in the spring, we sold our entire positions in a few companies after one of our no-cost brokers (LOYAL3) folded. At the time, we held very small positions in (K, KHC, DPS, and VHC) a few companies we decided to sell off. Looking back … this was probably a mistake … but a very minor one at that. We also added several new companies to the portfolio including – Best Buy (BBY), CVS Health Corp (CVS), Hormel Foods (HRL), Kroger (KR), Altria (MO), and Qualcomm (QCOM). Looking forward, I would expect to add a few more companies to our portfolio, while we continue to add to existing positions. I am excited about the past growth of our portfolio and can’t wait to report our 2018 results in another year! How did your dividend stocks portfolio do in 2017? Full Disclosure – At the time of this writing, we owned shares in the following stocks noted in this post – AAPL, ADM, AFL, CVS, MO, O, OHI, and TGT. The material above is not a recommendation to buy. Please do your own research on a company before deciding to invest.